Machines with rotating blade are used primarily for straight, long cross cuts. Thanks to the smooth, clean cut they are also excellently suited to knitted goods and knitwear as well as linings and other materials that are prone to fray or fluff. There are also various applications for the manufacturers of upholstered furniture and mattresses (cutting upholstery and diol fabrics etc.) in felt, cotton wool and dressing material, blanket, carpet and work wear factories. The rotating blade gets its cutting effect in combination with the knife-edged joints of the jaw, fitted to the base plate. 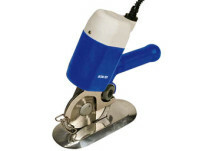 The integrated grinding device resharpens the blade. Steel blades with a higher service life can be supplied for extreme loads. The finger guard provides safety when cutting and protects against injuries.